Smog Testing Statistics - StarSmogCenter - Your Friendly Neighbor For Your Smog Check Needs! ​Aggregate data on over 80 vehicle makes and over 1,000 vehicle models we smog check every year. Our effort to arm consumers with the smog check industry knowledge! ​One of the most important decisions in a car buying process "will my car pass the biennial smog check mandated by the DMV"? At the time of purchasing a vehicle, it is the seller's responsibility to ensure that the vehicle they are selling passes the smog check. But what about subsequent years? That is the new vehicle owner's responsibility. You don't want to get stuck with a vehicle make that is notorious for smog test failures as that can cost you thousands of dollars of cost of ownership of that vehicle. We have collected and presented (to the right) smog testing data on 32 highest selling vehicle makes. Thinking of buying a Porsche? On average a 2003 Porsche passes the smog test 94% of the time. 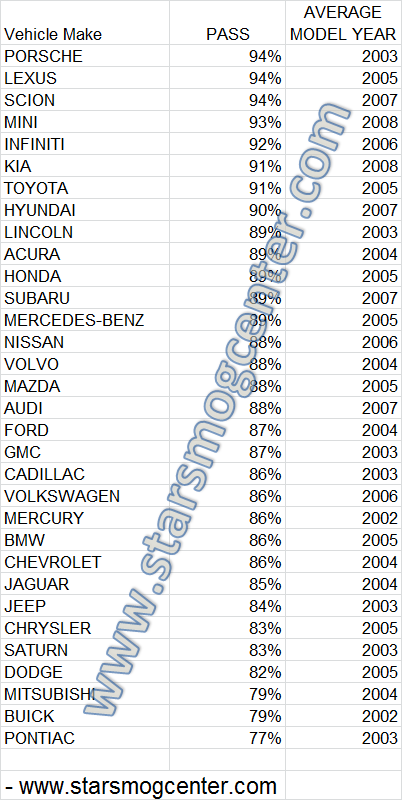 Below link to reference page shows that on average 2003 model year vehicles pass the smog test 88% of the times. That means, in general a 2003 Porsche does better at passing the smog test than an average vehicle make of 2003 model year. Contrary to the above, a typical 2003 Cadillac, with a pass rate of 86% does worse at passing the smog check than an average vehicle make of the same model year. Disclaimer - We are not affiliated with any vehicle manufacturers. While smog check statistics is an important factor to base your car buying decision; there are many other factors you should consider. The provided pass rate data is intended only for sharing the information we have gathered - we are not a car buying or selling service.